So excited to share my new bought shampoo last week.. 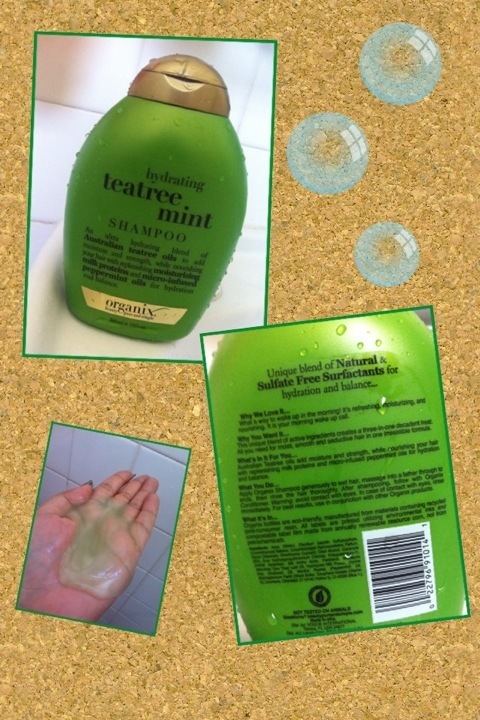 But due to a sudden hiccup, this post was delayed..
Bought my first full size organix shampoo.. Teatree Mint! Suitable for sensitive/ itchy scalp.. I will assume tt will be suitable for ppl who have dandruff problem too.. I have itchy scalp at times which will cause dandruff.. I hate that! But I must say, this shampoo hasn’t gv me itchy scalp problem since day 1 I used it.. It also has this gentle mint fragrance which my friend said smells like mint ice cream! Haha! What a way to wake up in the morning! It’s refreshing, moisturizing, and nourishing. It is your morning wake up call. Re-energize your hair with this unique blend of organic active ingredients creating a three-in-one decadent treat. All you need for moist, smooth and seductive hair in one irresistible formula. Australian Teatree oil adds moisture and strength, while nourishing your hair with replenishing milk proteins and micro infused peppermint oils for hydration and balance. Organix® bottles are eco-friendly, manufactured from materials containing recycled post-consumer resin. All labels are printed utilizing environmental inks and compostable label film made from annually renewable resource corn, not from petrochemicals. 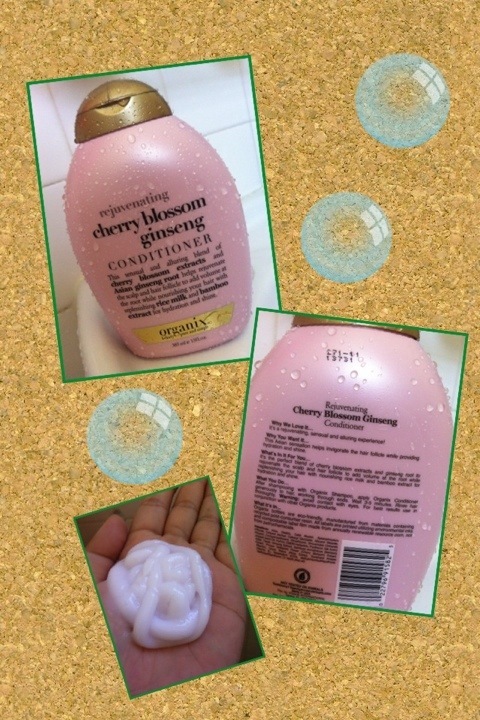 This is the conditioner I bought.. Cherry Blossom Ginseng! Smells really nice.. Doesn’t hv those choking strong ginseng smell, which some might not like.. Instead I think it has a really nice cherry blossom fragrance.. Sweet floral scent! It’s a rejuvenating, sensual and alluring experience! This Asian sensation helps invigorate the hair follicle while providing hydration and shine. It’s the perfect blend of cherry blossom extract and ginseng root to rejuvenate the scalp and hair follicle to add volume at the root while replenishing your hair with nourishing rice milk and bamboo extract for hydration and shine. I rmb once I watched TW variety show, the hair specialist said, we need not used the same type of shampoo and condition to wash out hair.. ie: using anti dandruff shampoo and anti hair fall conditioner is totally fine. U need not use anti dandruff conditioner to goes w ur anti dandruff shampoo.. Quite meaningless to get both same.. So for mi, I usually will get anti dandruff shampoo and one other “function” conditioner so tt my hair can have extra “protection”!!! Hahaha.. I think I will zoom dw to anti hair fall soon! But…. Using this organix product, I think my hair fall has reduced.. not too sure which one, shampoo or conditioner, does the magic! This entry was posted in .Care for Hair, Organix and tagged Hair conditioner, Hair shampoo by Tempted to Love. Bookmark the permalink.